Zeolite is used for the rehabilitation and improvement of livestock environments. Adding our zeolite odour control product ensures fewer malodours, smaller amounts of harmful gases, lower environmental footprint and better animal welfare. One of the major causes of animal husbandry odors is the generation of ammonium from urea and excrement. An average cow produces 83 lbs (38kg) of manure per day. With over 1.5 billion cows, 1 billion hogs and 50 billion chickens on the planet, waste management for this sector is a serious problem that our solutions can help resolve. Advantages of using zeolite for odor control of cattle, hog, and poultry environments is it prevents the formation of ammonia that causes noxious odor, it removes moisture, it prevents the leaching of nitrogen to the groundwater. Secondarily, the ammoniated zeolite byproduct then becomes a valuable secondary fertilizer when spread on fields. 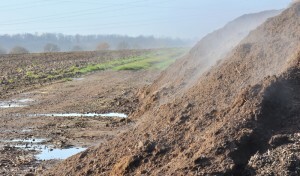 Typical zeolite odour control applications include as a compost additive for cattle, horse, and hog manure; as an ammonia suppressant for barn, swine & poultry houses; and for various consumer and carpet deodorizing applications. Zeolite is also used in quantity as a “kitty litter” – where it entraps vs. traditional clay – urine ammonia odours (the source of cat box odour).